SKY MAP: Planet Uranus' location as of 9 p.m. on Sept. 8 from mid-northern latitudes. Most people have seen the five brightest naked-eye planets, yetthere is a sixth planet that can be spied without optical aid—the planet Uranus. Of course, you'll have toknow exactly where to look for it. 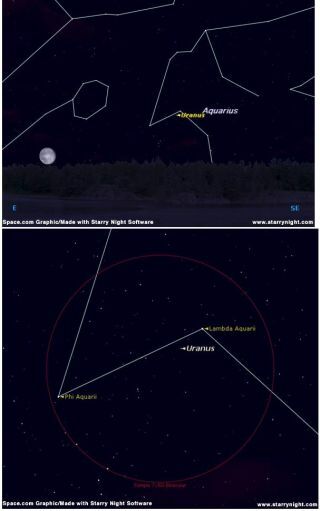 Fortunately, it is currently well placed for viewing in ourevening sky and with the bright Moon now out of the way this week; it will be agood time to look for it. Barely visible to the unaided eye on very dark, clear nights,the planet Uranus—currently shining at magnitude +5.7, which is right onthe verge of what'svisible with the naked eye under dark skies—is now visible during theevening hours among the stars of Aquarius, the Water Carrier. It recentlypassed through opposition to the Sun and is now visible for practically theentire night. It is best to study the accompanying mapfirst, then scan that region with binoculars. Using a magnification of 150-power with a telescope of at leastthree-inch aperture, you should be able to resolve it into a tiny, pale-greenfeatureless disk. Uranus, which lies nearly 2 billion miles from the Sun,has a diameter of 31,764 miles and according to flyby magnetic data fromVoyager 2 in 1986, has a rotation period of 17.4 hours. At last count, Uranus has 27 moons, allin orbits lying in the planet's equator in which there is also a complex ofeleven narrow, nearly opaque rings,which were discovered in 1978. Uranus likely has a rocky core, surrounded by a liquid mantleof water, methane, and ammonia, encased in an atmosphere of hydrogen, helium,methane and small amounts of acetylene and hydrocarbons. A bizarre feature ishow far over Uranus is tipped. Its north pole lies 98 degrees from beingdirectly up and down to its orbit plane. Thus, its seasons are extreme:when the Sun rises at its north pole, it stays up for 42 Earth years; then itsets and the north pole is in darkness for 42 Earthyears. Sir William Herschel discovered Uranus on March 13, 1781, noting that it was moving slowlythrough the constellation Gemini. Initially, however, Herschel thought hehad discovered a new comet. Eventually it was determined that Herschel's “comet”was in fact, a new planet. For a while, it actually bore Herschel's name. Herschelhimself proposed the name Georgium Sidus—“The Star of George,” after hisbenefactor, the King of England. However, the custom for a mythologicalname ultimately prevailed and the new planet was finally christenedUranus. Prior to Uranus' discovery, the outermost planet was consideredto be Saturn, named for the ancient god of time and destiny, but Uranus was thefather of Saturn and considered the most ancient deity of all. It probably was for all for the best. After all, ifHerschel's naming request had been granted, just think of how we might havelisted the planets in order from the Sun:Mercury, Venus, Earth, Mars, Jupiter, Saturn and . . . George? Joe Raoserves as an instructor and guest lecturer at New York's Hayden Planetarium. He writesabout astronomy for The New York Times and other publications, and he is alsoan on-camera meteorologist for News12 Westchester, New York. 1 AU, or astronomical unit, is the distance from the Sun to Earth, or about 93 million miles. Magnitude is the standard by which astronomers measure the apparent brightness of objects that appear in the sky. The lower the number, the brighter the object. The brightest stars in the sky are categorized as zero or first magnitude. Negative magnitudes are reserved for the most brilliant objects: the brightest star is Sirius (-1.4); the full Moon is -12.7; the Sun is -26.7. The faintest stars visible under dark skies are around +6. Degrees measure apparent sizes of objects or distances in the sky, as seen from our vantage point. The Moon is one-half degree in width. The width of your fist held at arm's length is about 10 degrees. The distance from the horizon to the overhead point (called the zenith) is equal to 90 degrees. Declination is the angular distance measured in degrees, of a celestial body north or south of the celestial equator. If, for an example, a certain star is said to have a declination of +20 degrees, it is located 20 degrees north of the celestial equator. Declination is to a celestial globe as latitude is to a terrestrial globe. Arc seconds are sometimes used to define the measurement of a sky object's angular diameter. One degree is equal to 60 arc minutes. One arc minute is equal to 60 arc seconds. The Moon appears (on average), one half-degree across, or 30 arc minutes, or 1800 arc seconds. If the disk of Mars is 20 arc seconds across, we can also say that it is 1/90 the apparent width of the Moon (since 1800 divided by 20 equals 90).